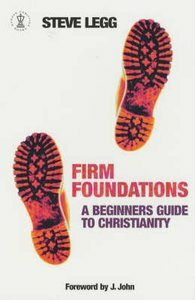 Written to help new Christians build the foundations they need, this book introduces and explains the fundamental themes and practices of the Christian life, covering* God, Jesus, the Holy Spirit, Church, the Bible, prayer, worship, baptism, Communion, evangelism, temptation and walking with God. - Publisher Steve Legg, escapologist and evangelist, has written this book to help new Christians build the foundations they need. In a friendly, witty style, he introduces and explains the fundamental themes and practices of the Christian life. Steve Legg, escapologist and evangelist, has written this book to help new Christians build the foundations they need. In a friendly, witty style, he introduces and explains the fundamental themes and practices of the Christian life. Steve Legg is an entertainer and motivational speaker, who has written 13 books and runs the ground-breaking men's Christian lifestyle magazine, Sorted.